AIM: Worldwide, the adoption of electronic patient recording system is increasing among many parts of the health sectors. Although paper-based recording of patients' information was a routine in many departments of dental schools, easy destruction of collected information and the costs of its conversion to electronic data, limited the availability of updated data at the department of dental public health. This paper aimed to explain the project of designing a system for Electronic Oral Health Recording (EOHR) in Isfahan dental school. The initial testing of system among dental students is reported too. METHODS: A situation analysis was conducted among the faculty members and dental students dealing with the Department of Oral Public Health. The content of EOHR was developed based on the WHO STEPwise model for chronic disease surveillance systems. The system was developed as an application for smartphone and a web-based database. The spiral model was applied in software development which was accomplished by the object-oriented programming method. After that, alpha and beta testing were done in target population. Data were compiled during the interview and oral examination by 40 dental students among 200 schoolchildren. It has been stored as a data bank following the network connection. The pitfalls of the system during its usage in dental public health course were evaluated as well. RESULTS: The baseline analysis of situation generally revealed a perception of need to change the existing paper-based recording system among the dental students and the academic members; it was summarized in five areas as follows: benefits restrictions, structural barriers, perceived advantages and feasibility. The application was designed and completed as six pages interface including demographic and follow-up page, socioeconomic status of family, oral health-related behavior, dental and gingival status, and quality of life. Drawbacks, such as nonresponded items, common assumptions, student registration page on the mobile, and modification in the output Excel file for analysis variables, have been resolved. CONCLUSION: A software application and web-based database were designed regarding the characteristics of Agile Unified Process development and educational dental setting. This system should be improved and established gradually. Conventionally, patients' information ranging from individual clinical histories to public research data has been stored in hard copy format all around the world. This kind of storage system demands ever-increasing space and is prone to easy destruction. It also poses difficulties in duplication of data when needed and even greater difficulty in organizing and aggregating the data for further analyses. Establishment of electronic health records (EHRs) allows easy access to the information by digitizing the contained information becoming a database. Such systems have been peddled as cost-effective and sustainable solutions for improving quality in medical care. Although some computerized decision support systems try to improve quality of care, a systematic review on EHR-based healthcare software showed that attributed improvements in patient care are more related to the enhancement of practitioner performances. However, the effects on patient outcomes remained still unknown or questionable. Development of electronic records for oral health requires substantial departures from standard EHRs. In other words, several specialty-specific hints need to be incorporated to maximize the benefits for patients, researchers, practitioners, and academicians, appropriately. Although development and assimilation of electronic oral health records (EOHRs) in clinical practice are becoming widespread,, their adoption in public research setting is still limited. Overall, EOHR is ascribed to any electronic repository of patients' oral health-related information in the form of a database. While developed countries, especially Canada, the United States, the United Kingdom, Germany, Australia, and New Zealand, are the pioneer of evolving workable EOHRs; development and adoption are also being reported from some developing countries such as Argentina, Brazil, China, Hong Kong, India, Indonesia, Korea, Malaysia, Singapore, Taiwan, and Thailand. EOHRs are slowly being recognized as the cornerstone of data storing and management on clinical, public health, and research settings in Iran as well. Along with the growing coalition of the Internet to the life, integration of information technology into the dental curriculum is inevitable. Many options, such as electronic patient records, data interchange, telemedicine, and evidence-based medicine, have been introduced to dental education setting since 1990. In public oral health, EOHRs provide benefits in storage, retrieval, and utilization of data and are key component of establishing efficient and effective evidence-based interventions. It can help to save time and money by reducing paperwork, transmitting data among researchers, and fast and easy data processing and analyzing. In general, it is advocated that EOHRs improve the accuracy, precision, and quality of data recording. Moreover, the ability to share data and continuity of projects would be improved using the electronic system. The Department of Oral Public Health in Isfahan University of Medical Sciences has been established with the inclusive mission of both coverage of dental student education and improving community oral health. The experiences of public activities in several target groups, including children, students, socially deprived and disabled people for assessing needs, and planning oral health promotion projects, have been lasted as long as 17 years. However, regularly, the whole recordings were paper based. Transferring the recording system from paper to electronic may involve dental students and faculty members as well as clients. In the following paper, the new system of EOHR designed for this educational public oral health setting will be explained and discussed. The study is designed in the form of action research. In the first step, the difficulties due to the paper-based recording and the need to providing the target group's data bank were identified. The data were gathered by observation the real setting, interviewing with faculty members, and a sample of students. Furthermore, the local available resources and infrastructure were studied. The theoretical framework for developing the content of assessment tool was based on the manual for information systems by World Health Organization on 2005 which stated a STEPwise approach to the surveillance systems for chronic disease (STEPS). It has three distinct levels for assessment: Step 1, generally contained markers of socioeconomic status, tobacco and alcohol use, nutritional status, and physical activity collected on self-reported manner; in Step 2, the physical measurements have been added; and in Step 3, if the resources were available, additional tests were obtained. Recently, an adopted module for oral health surveillance has been driven from STEPS. It contained a core, expanded, and optional modules in three levels. The content of our tool in the first step encompasses the demographics (name, age, gender, grade, school, and socioeconomic status [parent's job and educational level, housing, family number, and car owning]), and follow-up address as well. Common modifiable risk factors, such as oral self-care, service usage, and diet analysis, ascertained by personal reports. In the second step, dental health status was recorded after clinical examination according to the WHO guideline. The last screen contained the questions about individual's quality of life. The primary school's students invited to the study after the legal agreement. An informed consent derived from students regarding their parent's permission and ethical issues. After the initial testing of the application by the investigator, it was provided to the volunteer and 5th-year undergraduate dental students for the alpha testing. During a pilot study, data were collected from 200 primary schoolchildren in 2017. Changes made from the results of this test were applied and subsequently, for beta testing, the software has been provided to all students as a part of obligatory dental public health course. 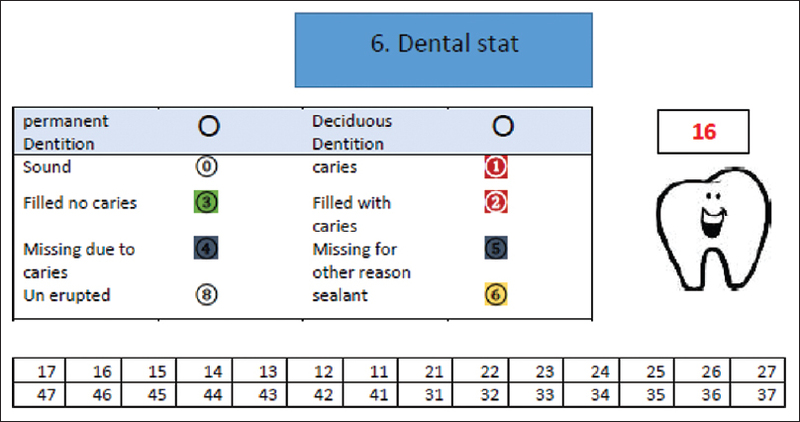 In addition, the finding, about the attitude toward EOHR which was conducted in a sample of 40 forth-year dental students, is shown in [Table 1]. Overall atmosphere to launching electronic settings is popular in Iran. Particularly, in the Ministry of Health and Medical Education, the largest health information technology projects in the country will be followed. Given the scale of the project, various aspects including hardware, software, network infrastructure, communication, etiquette, education, culture, fundamental research, and other items intended in this project. From the other side, in recent decades along with the priorities of the Ministry of Health policies for Iranian oral health and the emphasis on evidence-based approaches to prevention, several oral health promotion programs have been planned. These programs are implemented through a contract between the Bureau of Education and the School of Dentistry under the supervision of faculty members. The implementation of health information systems is being as a priority issue, at the university research centers, too. Development of this software has been based on Agile Unified Process development methodology because the similar examples were not available in the country. The software was gradually developed to meet the requirements, as the requirements were not explicitly explained at once. Regarding the spiral model used in software development, the online registration of the patients' information has been formed the first round of this spiral model, which has been optimized gradually to speed up the data entry and also easier working by getting feedback from the users. Technically, the Object-Oriented Software Development Method was applied. Application functions were performed by objects defined by existing classes. These classes were in the form of a layered architecture. The highest level of work displayed the interface of the software with users. The middle layer contained classes that control the program's logical function, and finally, the underlying layer was the storage and availability of data related to the program. The application was written using the Java platform, and for a graphical interface, XML language program in Android environment was supplemented. The necessary conditions for the development of the application have been provided with Eclipse software. Oral Health Record App was tested with “1.0” code and supported by Android 2.2 and above. Since patient information was collected in outreach setting and limitation of free net connection, the software kept users' information in their place and the task of synchronizing information with the server done at the availability of the Internet. For this purpose, the user information has been stored in the form of a database of SQLite type within the client mobile phone. After viewing and browsing the recorded information it was sent them to the server. The process of sending data is done using the REST API method. Patient information is extracted from the database and sent to the JSON text file for a specified address to record information according to this protocol. The posting method is also used to keep users safe and to hide the information from the perspective of others in the form of a POST. Due to the simplicity and low diversity of functions on the server side, a shared host has been used for this software. The MYSQL database server collects all patient information provided by mobile client users. 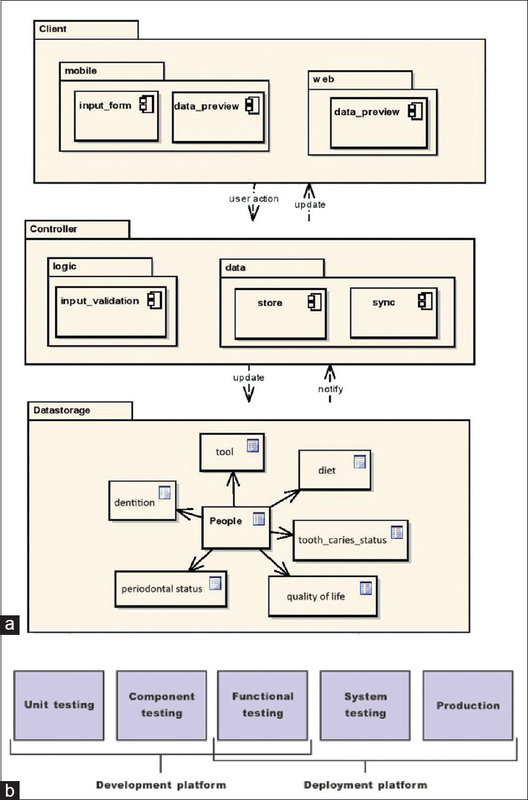 The design of this database is a relational database. The [Figure 1]a illustrated the components of software in three levels. At the first level, information is received from the audience by interview and clinical examination by the final user. Clients are dental students or their supervisors. The other client is the project manager who has access to the data bank. In the second level, controller verifies, handle, and take care of data. To the storage and processing of information, at third level, a server has been considered for holding the information. The server also provides the manager with the data required for processing and analysis the results. The interface layer between the mobile's client and this reference database has been developed in PHP language. It is also used to send SMS messages to children's parents for unhealthy teeth from a third-party server for this action. In the software release cycle, tests are made as [Figure 1]b which unit test, component test, and functional test were done through software development, while system testing was an interaction between developer and customer. After the initial revising of the program, the software for the alpha testing was installed by the volunteer dental students. Recording of default values for spatial parameters such as city and school was among the changes made from the results of this test. Hence, the coding options were designed as graphically selection tabs and colored items. Subsequently, for beta testing, the software was available to students by a quick access link which was provided on the specific homepage of dental school. As the application was developed in Persian (local) language, [Figure 2], [Figure 3], [Figure 4] demonstrated some of the screenshots of client interface of software in translated format. In addition to the report of raw data as an excel file, administer has an update report of the basic statistical analysis such as frequency of all variables including demographic, SES, oral health-related behaviors parts as well as teeth caries status, and child quality of life. In addition, it is possible to see the cariogenic risk of student's diet as low-, moderate- or high-risk grading. The descriptive analysis of dental caries indices and the quality of life scores can be shown at a time. The parents could take the notification about their child dental treatment needs, emergencies, or referral information as message. The complete report about examined children is not at the objectives of this manuscript. Based on the recommendations issued by the WHO, for effective decision-making and health planning, oral health information system should covered the aspects of risk factors of oral health, oral health-related quality of life, services and interventions, administrative processes, and quality and outcomes of care in addition to clinical, epidemiological information. In this regard, the WHO has provided two major tools for health information systems as well as oral health. The STEP approach and the WHO Global InfoBase both based on the views of the common risk factors and providing effective communication with policymakers, donors, and the general public. 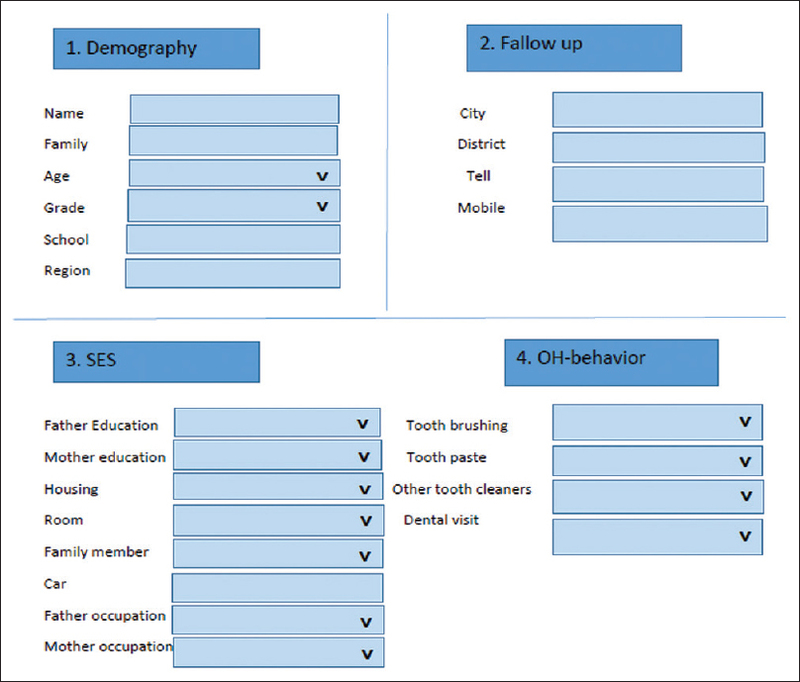 This study attempts to consider the fundamental variables in developing the appropriate application for oral health data gathering in an academic public health setting. In Iran, recently, the approaches of public-based planning for oral health promotion are growing rapidly, and it becomes as a top priority of health. In this project, we attempt to apply an evidence-based concept to produce the tool along with considering the properties of educational setting and public clients. The experiences of developed countries are promising in changing the traditional recording customs to new EOHR systems. For example, in South Wales of Australia, both paper and electronic system, are used to record patients' information and management services. The clinical services delivered by dentists are recorded in a Central Information System for Oral Health. In 2011, a study by Masoe et al., about the reliability of information and agreement between two systems was done. Items of this project included oral examination, periodic examination, periapical and bitewing radiographs, professional brushing, topical fluoride, nutritional advice, oral hygiene instruction, and fissure sealants. In general, the agreement between two methods was 95% with a kappa coefficient of 0.88. In Thailand, a health monitoring system designed and implemented. In this system, dental and oral diseases with International Classification of Disease codes were determined, and links related to the proposed intervention or treatment is available. In 2012, this system was evaluated in some dentists using both qualitative and quantitative methods. The overall satisfaction for oral health index, treatment planning, and the ability to use oral health information system was measured. The qualitative themes of this study could be considered for following evaluation phase of our project. In Denmark, the designed information system for oral health is integrated to the health system, and it has a total coverage for child population. In the academic setting, at the University of British Columbia (2005–2010), an electronic record system for all fields of dentistry has been designed and completed gradually. This application is constantly evaluated by the faculty staff and students. Based on the general changes in health information management, it seems that substitution of paper-based recording to electronic systems in the dental school would be a long-term vision of all departments. Regarding the hopeful experiences of other countries and also the suitable situation for changing the paper-based oral health recording system to an electronic form, this project has been established. The application is designed and pilot tested in this phase. The replacement of such system will be continued in the future and evaluated regularly. The electronic oral health recording system, which is developed during this project, is useful for community dental health setting as a need assessment tool. 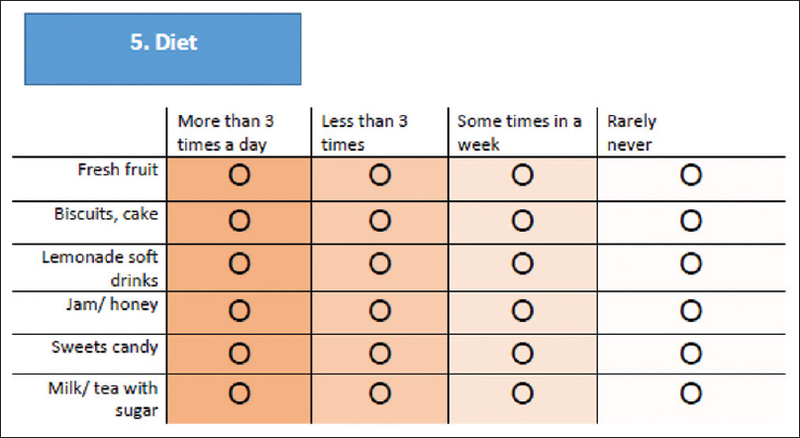 In addition, the attributed data bank makes a reference for program planning and interventions. It would be substituted in other departments of dental schools, gradually. This project was scientifically supported by the National Agency for Strategic Research in Medical Education. Tehran. Iran. Grant No. 960042 and Research Bureau of Isfahan University of Medical Sciences. Grant No 194047. In addition, the nice cooperation of our computer programmer, F. Agha Davood is highly appreciated. This project was funded by the National Agency for Strategic Research in Medical Education. Tehran. Iran. Grant No. 960042 and Research Bureau of Isfahan University of Medical Sciences. Grant No 194047. Häyrinen K, Saranto K, Nykänen P. Definition, structure, content, use and impacts of electronic health records: A review of the research literature. Int J Med Inform 2008;77:291-304. Linder JA, Ma J, Bates DW, Middleton B, Stafford RS. Electronic health record use and the quality of ambulatory care in the United States. Arch Intern Med 2007;167:1400-5. Garg AX, Adhikari NK, McDonald H, Rosas-Arellano MP, Devereaux PJ, Beyene J, et al. Effects of computerized clinical decision support systems on practitioner performance and patient outcomes: A systematic review. JAMA 2005;293:1223-38. Schleyer T, Spallek H, Hernández P. A qualitative investigation of the content of dental paper-based and computer-based patient record formats. J Am Med Inform Assoc 2007;14:515-26. Greenwood SR, Grigg PA, Vowles RV, Stephens CD. Clinical informatics and the dental curriculum. A review of the impact of informatics in dental care, its implications for dental education. Eur J Dent Educ 1997;1:153-61. Heid DW, Chasteen J, Forrey AW. The electronic oral health record. J Contemp Dent Pract 2002;3:43-54. World Health Organization. Electronic Health Records: Manual for Developing Countries. Manila, Philippines: WHO; 2006. p. 10-6. Chattopadhyay A, Coelho de Souza T, Arevalo O. Electronic oral health records in practice and research. In: Daskalaki A, editor. Dental Computing and Applications: Advanced Techniques for Clinical Dentistry. New York, USA:Medical Information Science Reference; 2009. p. 209-12. Petersen PE, Bourgeois D, Bratthall D, Ogawa H. Oral health information systems – towards measuring progress in oral health promotion and disease prevention. Bull World Health Organ 2005;83:686-93. Masoe AV, Blinkhorn AS, Colyvas K, Taylor J, Blinkhorn FA. 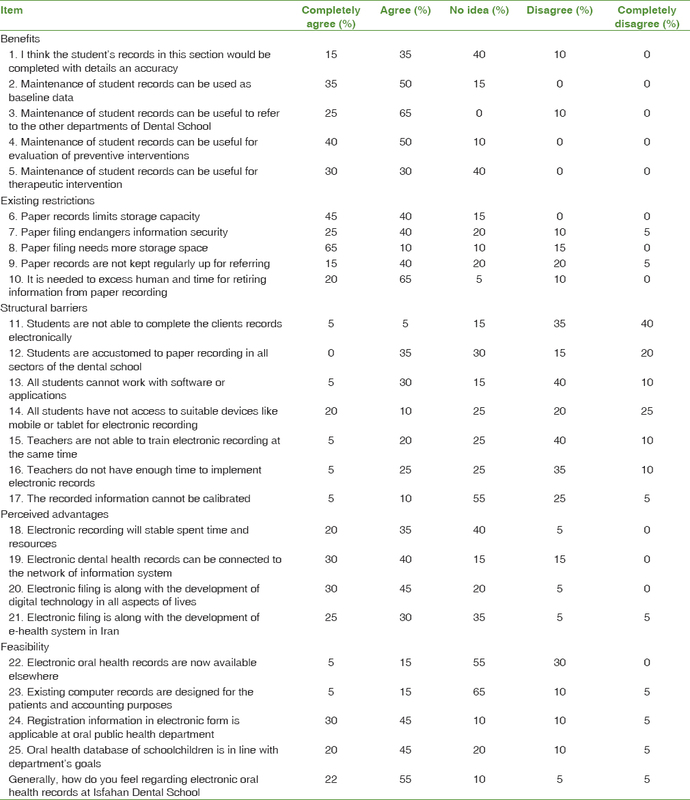 Reliability study of clinical electronic records with paper records in the NSW public oral health service. Public Health Res Pract 2015;25:e2521519. Wongsapai M, Suebnukarn S, Rajchagool S, Kijsanayotin B. Health-oriented electronic oral health record for health surveillance. Stud Health Technol Inform 2013;192:763-7. Danish National Board of Health. Dental Caries in Danish Children: 1973-2004. Copenhagen: National Board of Health; 2005. Wagner IV, Lex MacNeil MA, Esteves A, MacEntee MI. An electronic oral health record to document, plan and educate. Eur J Dent Educ 2015;19:209-16.